Mathis Schwentker had never traveled to the United States, nor had he ever met Christian Heineking—yet in September 2018, he found himself in an airplane seat heading to Hudson Oaks, Texas, to ride for Heineking. When Heineking broke his leg in August, forcing him out of the tack for a few months, mutual friend Thilo Schulz put them in contact and urged Schwentker to take the opportunity to help at October Hill Farm Sporthorses. Schwentker had already made a name for himself in Germany, most notably winning the German Professional Riding Championships in 2017. But when he traveled Stateside, he quickly proved his winning reputation would continue by topping his first U.S. grand prix in October at the American Royal Hunter Jumper Horse Show (Missouri) and placing second in the National Sunshine Series I $100,000 Coachella Grand Prix (California). When Schwentker returned to Heineking’s farm on Jan. 9 after the holidays, he picked up where he left off. With NKH Caruso, he claimed top honors in the $30,000 SmartPak Grand Prix and $70,000 Back On Track Grand Prix at HITS Coachella Desert Circuit I (California), to only win the opening grand prix again the second week. And NKH Carrido was the only horse to jump clean in both HITS $1 Million grand prix classes, held at Coachella and Ocala, Florida. 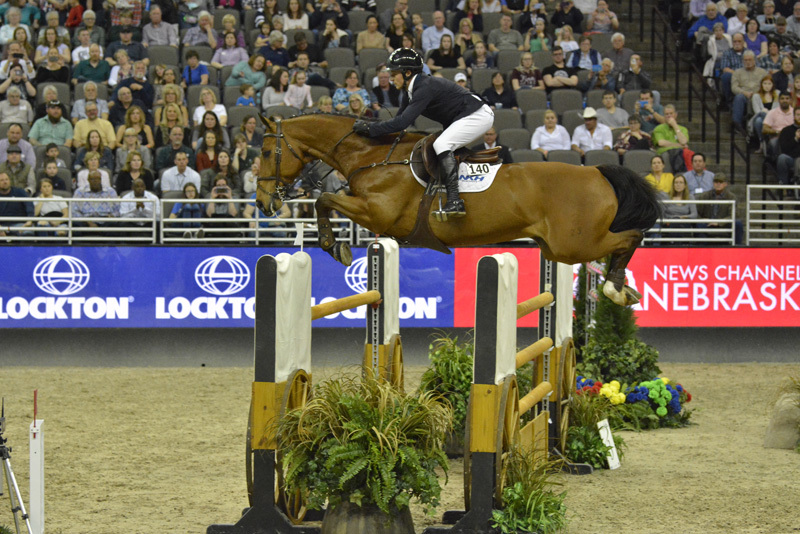 Caruso and Carrido were two of Heineking’s successful grand prix horses before his injury, but with Schwentker in the irons, Heineking didn’t hate his new vantage point. And even when he started back riding, he left those mounts in Schwentker’s capable hands. “It just gave me a better chance to recover,” said Heineking. “It’s really not that frustrating [sitting on the sidelines] if you have somebody you can work with like him. It’s a really good relationship. And coming off their eighth-placed finish at the HITS Ocala Great American $1 Million Grand Prix, Schwentker had just two weeks left before his visa expired—and he needed to make the most of it. Starting back in Texas at Pin Oak Charity, aboard NKH Caruso, Schwentker took the first two of the final four by winning the $25,000 Walter Oil & Gas Corp. Grand Prix and then the $30,000 Hildebrand Fund Pin Oak Charity Grand Prix. 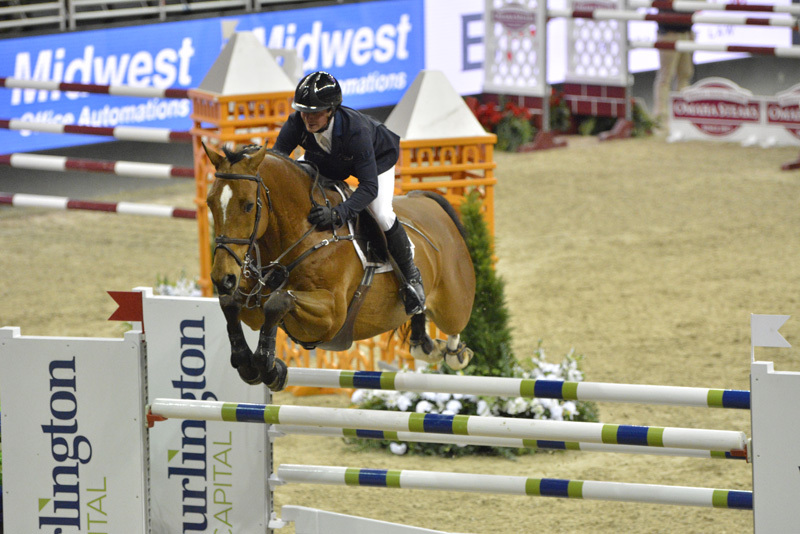 And after trekking north to Nebraska for the Burlington Capital International Omaha, Schwentker claimed the blue and red ribbons in the $100,000 RFD-TV InIt2WinIt Speed Jumping Series Championship before capping off his American visit with the top check in the $100,000 International Omaha Grand Prix with Caruso, held on April 6. Although his future American endeavors remain a little up in the air, Schwentker hopes to return in a few months with a working visa. But even still, he’s proud of the victories he could accomplish thousands of miles from Germany with different competition.